Students, faculty, family and friends came together for an afternoon of mourning on Remembrance Day to honor the recent deaths of Ramapo College’s greatest community members. Held in The Angelica and Russ Berrie Center and conducted by President Peter Mercer, friends and families of the deceased offered one last goodbye to loved ones of the college. Established by the Ramapo College Board of Trustees in 2005, Remembrance Day is an annual event created to memorialize the deaths of members of our campus who have significantly contributed to the college and who passed away in the preceding calendar year according to pamphlets handed out at the event. As the Berrie Center began to fill, President Mercer took the stage to give a little history on Remembrance Day and remind families and friends that they had gathered to celebrate the contributions and lives of the recently deceased. Mercer then went onto to read the names of the deceased and proceeded to ask surviving family and friends to stand to honor the accomplishments of their loved ones. Additionally, each of the deceased were given a brief moment of silence. Members of the recently departed included, but was not limited to, students like 25-year-old Thomas Joseph Franzese, Jr; staff like 78-year-old Geraldine Meyer; and benefactors like 84-year-old Robert Daniell. 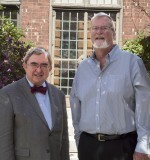 Current and former faculty, staff and students continued to rise as each of the honoree names were read out by Mercer, with a notable sense of pride being taken by some of those gathered as the accolades and achievements were read off. Representing the SGA, sophomore Ryan Greff attended the event to remember individuals who impacted his life at Ramapo College, honorees like the recently deceased Millicent G. Anisfield. “Mrs. Anisfield did an incredible amount of work for the College, her legacy that she left behind will stick with me for a long time,” said Greff. Midway through the event Ramapo’s 4GotteN SuitCase came onto the stage to perform a melancholy song titled “Lights.” Aptly wearing all black, the group gave an emotionally-filled performance which was well-received by the audience. Following the presentation Mercer continued to read off the final list of honorees pausing occasionally to offer personal stories he had with the deceased — one heartwarming yet surprisingly funny story about staff member Janet Williams notably made the crowd roar with laughter. 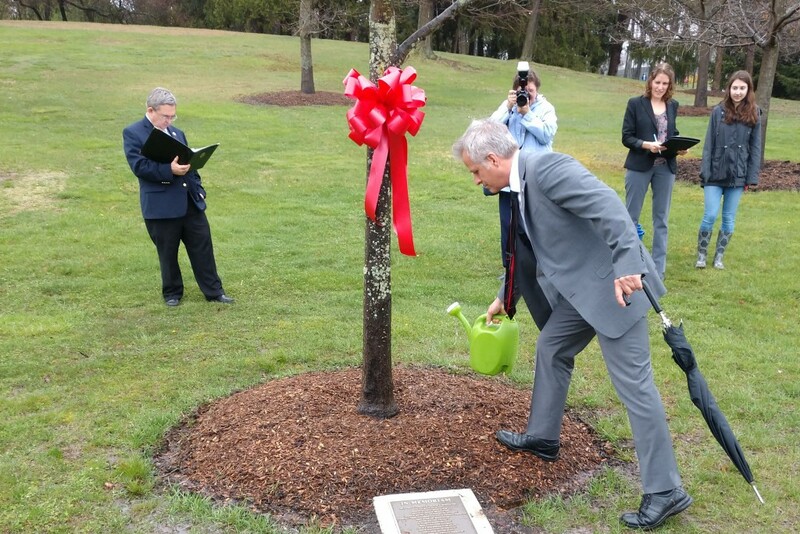 The event concluded when President Mercer led the gathered crowd to Memorial Grove to conduct the final actions of Remembrance Day by watering the newly planted tree representing the deceased for 2017. As rain continued to drizzle on attendees, Mercer joked that the watering was only a symbolic last step, not a literal one, in honoring those which we have lost. Each group of family members representing the deceased approached the tree one after another to water it as a symbolic final step in Remembrance Day. President Mercer thanked the gathered one last time after the last family watered the tree.